Overview: never trust an atom, they make up everything! Atoms are the fundamental building blocks of matter and are built from protons, neutrons and electrons. A useful way to approach the teaching of atomic structure is to consider the changing models proposed by scientists throughout history. The image here could represent a progression in how students understand atomic theory, starting with a simple billiard ball model at Key Stage 2/3 and ending with the electron cloud model at A Level. As well as understanding that atoms are made from different subatomic particles, students also need to understand that these subatomic particles differ in their size, location and charge. It’s worth spending time explaining how atoms are held together by electrostatic forces of attraction between electrons and the nucleus (both directions) and by nuclear forces of attraction between nucleons. Key concept: matter is made from discrete units called atoms. Atoms can differ from each other in the number of protons, neutrons and electrons they contain. Misconception [scientific idea]: the electrons in an atom orbit the nucleus like planets in our solar system orbit the sun [electron shells represent the specific amounts of energy electrons have, not where electrons are located]; the nucleus of an atom is equivalent to a nucleus in a cell [they are not analogous]. For a detailed explanation of alternative conceptions about atomic structure see this excellent publication from the RSC on chemical misconceptions. Challenge students to tear a piece of paper into the smallest size possible. Then pose the question, ‘can this piece of paper be broken down further’? Explore ideas on the board and then introduce the idea of atoms, building on what students already know about particles. A fun thing to do is then ‘build an atom together’ using a range of artefacts to represent the different parts. Neutrons and protons should be represented by similar sized objects, with the same mass. Electrons can be represented by something with a tiny mass – such as a hair plucked form your head! Mass number and atomic number – what do they mean? 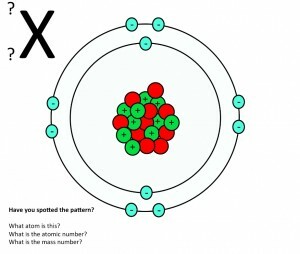 Follow this link for a GCSE activity where students have to decide if a model shows an atom or an ion. Students need to understand and explain why isotopes have the same chemical properties but different physical properties. Heavy water can provide an excellent context to study isotopes. Ice cubes of heavy water sink in water. Perhaps get students to Predict, Observe and Explain what is happening in the video below from 6:14. Then move on to get students to calculate the relative atomic mass for hydrogen. Why is it not simply an average of the three naturally occurring isotopes 1H, 2H, and 3H i.e. 2 and not 1.00794? If atoms are mostly empty space, why does it hurt when we bang into a wall? Why is it not possible to know precisely where an electron is? How is an atom similar and different to the solar system?